SanDisk just announced an absurdly fast card that can go almost three times faster than the previous champ. Why do you need all that horsepower? To chomp 4K video, of course. 4K, the next standard for ultra-high definition video, requires huge amounts of data to form the crystal clear images. 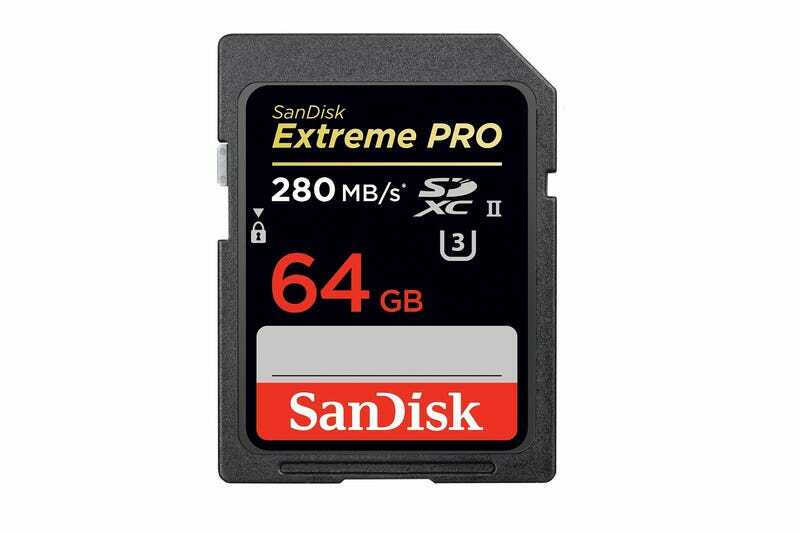 For the newest breed of camera that wants to pack 4K capability and other high-speed shooting specs, they are going to need a memory card that can handle the heavy load. Like this one! It promises transfer speeds of up to 280 MB/s.To give you an idea of the speed, the previously fastest SD card that SanDisk offered was 95 MB/s. That's a huge bump that should be capable of handling 4K video with ease at maximum sustained transfer rates of 30 MB/s. Though not many cameras are going to be compatible for a while, SanDisk is saying that the new Fujifilm X-T1 mirrorless camera is the first. This may be true, but is slightly misleading, as most existing high speed SD cards should be able to handle the data load of a camera like the X-T1 just fine. The real benefit should come when it works with cameras that shoot 4K and feature ungodly speed-related specs not yet known. Sandisk's announcement comes on the heels of Panasonic's superfast SD card, which was introduced with the company's 4k-shooting GH4 camera. That card also boasts sustained video transfer rates of 30 MB/s. With Kingston also dropping a version of the new class of card, consumers are sure to have plenty of options for insanely high speed memory. SanDisk Extreme PRO SDHC/SDXC UHS-II cards will be available in April ranging from 16 GB for $120 to 64 GB for $300. A special USB 3 card reader will also be available for $50.